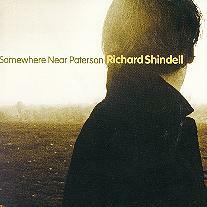 George Graham Reviews Richard Shindell's "Somewhere Near Paterson"
A new generation of singer-songwriters emerging in the 1990s has very much revitalized the form that got its start back in the 1960s with artists like Bob Dylan and Joni Mitchell. While thoughtful singer-songwriters are not considered hot commercial properties by the major record companies, who prefer to invest their resources in the teenage pop group of the week, the so-called New Folk scene is nevertheless prolific, with great numbers of worthwhile CDs being released by independent labels and the artists themselves. Yet another of the bright lights on this scene is Richard Shindell, who has just released his fourth solo album called Somewhere Near Paterson. Richard Shindell is based in the New York area and has been attracting attention for the last eight years with his thoughtful, often lyrically complex songs, frequently telling genuinely interesting narratives. His songs tend to have a bittersweet quality, while his warm, but slightly-weathered tenor vocals have been compared to everyone from James Taylor to R.E.M. 's Michael Stipe. In 1998, Shindell got together with two other respected Nineties generation singer-songwriters, Dar Williams and Lucy Kaplansky to form a supposedly one-off trio called Cry Cry Cry, expecting to do a few appearances together and make one record. But Cry Cry Cry turned out to be more successful than anyone had expected, becoming one of the top 50 national tours, in terms of ticket receipts. Shindell also toured with one of the great names of the 1960s folk scene, Joan Baez, who was so taken by his songwriting that she included three of Shindell's compositions on her own Gone from Danger album. Now for the first time in almost three years, Shindell has a devoted himself an album of his own. Somewhere Near Paterson is one of his finest yet. Again, Shindell creates songs that are far from the pop mainstream lyrically, with fascinating subjects like a woman's search for her granddaughter whose parents disappeared in political turmoil, passing by an house where one used to live, the death of an old grocery store, and a surrealistic story of road rage and a prison concert. His words and narratives can take on a metaphorical quality, making them seem larger than the contemporary events that inspired them. Shindell enlists Larry Campbell as producer. Campbell has played guitar with Bob Dylan, k.d. lang and others, and also produced Shindell's critically-acclaimed 1997 release Reunion Hill. They come up with arrangements that can get rather electric, though they are not far in spirit from the acoustic singer-songwiter mode, with some occasional and surprising bits of Irish influence here are there. His colleague in Cry Cry Cry, Lucy Kaplansky makes guest appearances doing backing vocals, and Shindell covers a song by the other Cry Cry Cry member Dar Williams. Producer Campbell is rather prominent on the CD, playing a variety of guitars, Dobro, mandolin, etc., adding a lot of interesting colors to the recording. Richard Shindell is one of a bright constellation of fine singer-songwriters to emerge in the last decade. He creates memorable, often powerful songs that usually form unconventional narratives. Like the best lyricists, he can make profound metaphorical observations beyond the story line. His impressive new CD Somewhere Near Paterson tastefully highlights his excellent writing, though it also includes a couple of cover tunes as well. As a member of the popular trio Cry Cry Cry, Shindell has been getting a fair amount of public exposure since his last solo recording in 1997. Now Somewhere Near Paterson will allow Cry Cry Cry fans to hear Shindell's songs front and center in this CD which was released under an unusual 50-50 partnership agreement with his record label. In terms of sound quality, the album is a bit of a disappointment. The mix by respected producer/engineer Ben Wisch is generally commendable, but there is too much audio compression in the overall sound, making the CD seem overly loud for the style and taking away the dynamics of the performance. With so many good singer-songwriters on the scene these days, it's hard to for an artist to be noticed. Richard Shindell has the advantage of his work with Cry Cry Cry, and is already a favorite of critics and other artists. His new fourth solo album is also likely to be well-received among his peers, and will hopefully get some public recognition for this gifted artist and splendid songwriter.